Our candles are 100% natural, free from paraffin/petroleum wax and have been created sourcing the finest ingredients. Using only crops grown in an ethically responsible environment without synthetic fertilisers and pesticides. The wicks are lead free and made from natural fibres which burn without releasing harmful pollutants, toxins or creating soot. All of our wax blends contain no artificial fragrances, no artificial colours and they have not been tested on animals. 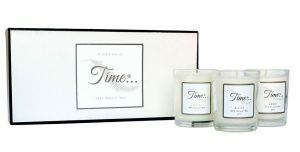 A little box of time… is the ultimate gift idea for any occasion. It’s the best candle I have ever had for filling the house with the lovely scent. Will certainly be buying more! 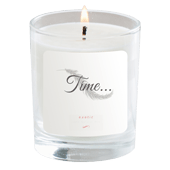 Your Embrace candle is gorgeous, the fragrance comes through very quickly. Shipping is for domestic orders in the UK only and we send our products first class by Royal Mail. For international orders, please CONTACT US to arrange payment and delivery. Currently we only accept payments by PayPal. This makes it easy and convenient for our customers and you can use your normal debit or credit cards even if you don’t have a PayPal account.